Nowadays most people are online while they are on the go - via smartphone, which is less used to make calls but more to inform: checking the weather, the correct route, the latest rumor or the current news. Often smartphone users need very specific information about a particular place or an event. The best information carrier therefore is a mobile landing page - what we call a website optimized for smartphone and tablet devices - focused entirely on specific content. 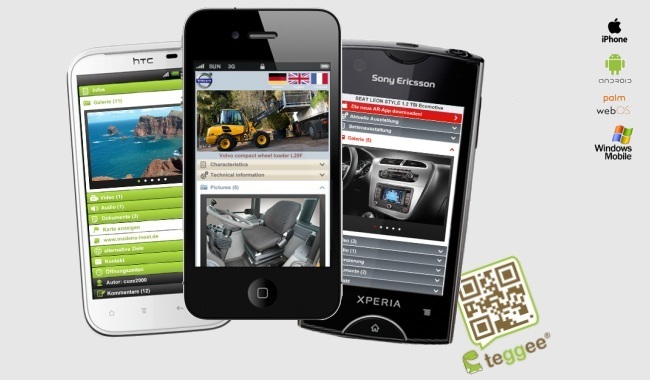 teggee is the Mobile Landing Page Builder, which enables everyone to create a mobile website in minutes. Whoever wants to offer people location-dependent, event-based and/or frequently changing information, should set up mobile landing pages. Through a user-friendly application, information can be entered or changed in an organized manner. The mobile landing page is created automatically and in real time. So that people can quickly access a mobile landing page, teggee creates the appropriate access code immediately in one step. Just like that! This web site also contains links to other Internet sites. We hereby explicitly point out that we have no influence on the content and design of those linked Internet pages and are therefore unable to guarantee actuality, correctness, completeness or quality of the contents published there. We therefore distance ourselves from the contents of all external sites. This declaration is valid for all external links and its contents which are not part of our website. You will also find a plug in all our sites which allows a direct connection to servers of social networks. In this case, information on visits to our sites can be transmitted to these social networks. The creator of a teggee-page is solely responsible for its content.